Another of the earliest mills grew up on the West Branch of the Housatonic, but near the center of the town. Initially called the Pittsfield Woolen and Cotton Company, it was run by members of the Federalist political party in direct competition with another mill under the direction of Democrats, the Housatonic Mill across town, near present-day Elm Street. The connections of the principal owner, Lemuel Pomeroy, show how close knit this textile manufacturing business was in Pittsfield. For one, Pomeroy was able to draw into his new enterprise in 1814, the well-known inventor, Arthur Schofield who had introduced the first carding machines to Pittsfield (see also Stearnsville.) He hired as his first superintendent, James Colt, who arranged to have the first structures for the mill complex up and running by 1815. Shortly thereafter, Pomeroy turned over the superintendent’s position to Thaddeus Clapp, whose son went on to be President of Pontoosuc Woolen Mill. 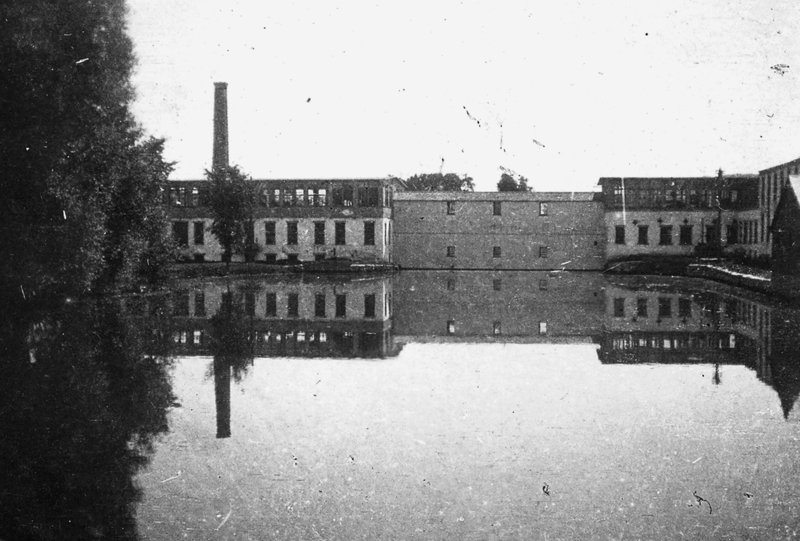 The first building, a three-story brick plant with an attic, spanned a distance of 80 feet long and 45 feet wide. Inside ran one of the largest and most profitable woolen operations in the town in the years before the Civil War, employing over 200 men, women and children to run 80 looms. Pomeroy continued to purchase land and old mills upstream to expand his enterprise. In 1839, he brought his sons into the business and changed the name of his mill to L. Pomeroy & Sons. Only one, Theodore, had the interest in and talent for running such a complex, and he kept the mill operating until his death in 1881. A group of trustees ran the mill before his son came of age and they carried on the business for more than a decade. Still, it was unable to withstand the economic downturns in the 1890s. Helliwell & Co. purchased the mill in 1898 and continued to operate it until 1912. They sold the complex to Eaton, Crane and Pike, whose paper mill was on the other side of the river and was rapidly expanding its business. The old brick satinet building was torn down in 1904, and the rest of the lower mill was eventually razed. Several buildings of the upper mill complex still stand and house small businesses.